Get Shorty can supply you with a professional spotter for those stubborn spots, or you can make up a spot kit by using the following products that are usually found in most households. Mix one teaspoon of clear dishwashing liquid (containing no bleaches or strong alkalies) + 1 teaspoon of white vinegar with 500ml of warm (not hot) water. This solution must be well rinsed with clear water. Mix one teaspoon of clear (not cloudy) household ammonia with 100ml of water. 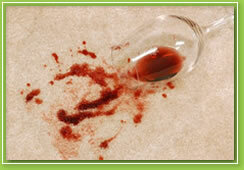 Once stain is removed the carpet must be neutralised with vinegar solution. Apply, blot & rinse. Wool and treated nylon carpets are adversely affected by ammonia. Substitute for 2 on chart. Mix 100ml of white vinegar with 200mls of water. A dry-cleaning solvent or solvent substitute e.g. Murlex (available at grocery and hardware stores). Use on dry carpet only. Some chemicals are hazardous (corrosive, flammable,toxic, etc;) and should be used with great care, strictly in accordance with their use and safety directions. If you are unsure, or not confident, call Shorty first. If you attempt spot removal, try only ONE SMALL AREA. Do not treat all spots, if one does not work, it is highly unlikely that it will work on others. DISCLAIMER: This spotting guide is intended as a help feature only. Due to products being used beyond our control, Get Shorty Carpet & Upholstery Care take no responsibility for improper use &/or any damage to any fabrics that may be affected by using the above methods and/or products. If you wish, Get Shorty can also supply you with a professional spotter.